The SDOCK4U33 four-bay 2.5/3.5" SATA HDD / SSD docking station lets you dock and swap four drives from your desktop or laptop computer simultaneously, using a single USB port. Get the most out of your SATA III (Gbps) solid state drives and hybrid drives with this UASP (USB Attached SCSI Protocol) enhanced hard drive docking station. With performance up to 70% faster than conventional USB 3.0 when paired with a UASP-enabled host controller, UASP ensures high performance by reducing bottleneck. See our UASP testing results below for further details. The hard drive dock features independently-powered SATA connectors for each individual drive, ensuring you can operate drives separately. This gives you the freedom to hot-swap one drive while transferring data to another, saving you time. Plus, the built-in fans keep your drives running cool, ensuring optimal performance and helps to prevent premature drive failure. Extend the value of this hard drive docking station further with the addition of our SATA to IDE Hard Drive Adapter (SAT2IDEADP), allowing easy insertion of any 2.5 or 3.5in. IDE hard drive into a SATA hard drive dock. To ensure compatibility with your computer system, the SDOCK4U33 supports all of the leading operating systems, including: Microsoft Windows (8/7/Vista/XP/Server 2008/Server 2003), Apple OSX (10.9/10.8/10.7/10.6), Linux, and Google Chrome OS. 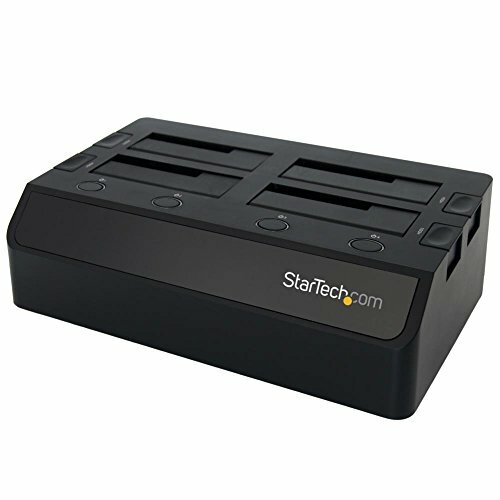 SDOCK4U33 is backed by a StarTech.com 2-year warranty and free lifetime technical support.